Greece and the Former Yugoslav Republic of Macedonia (FYROM) have signed a deal that, if ratified, will resolve a decades-old dispute concerning the latter country’s name. 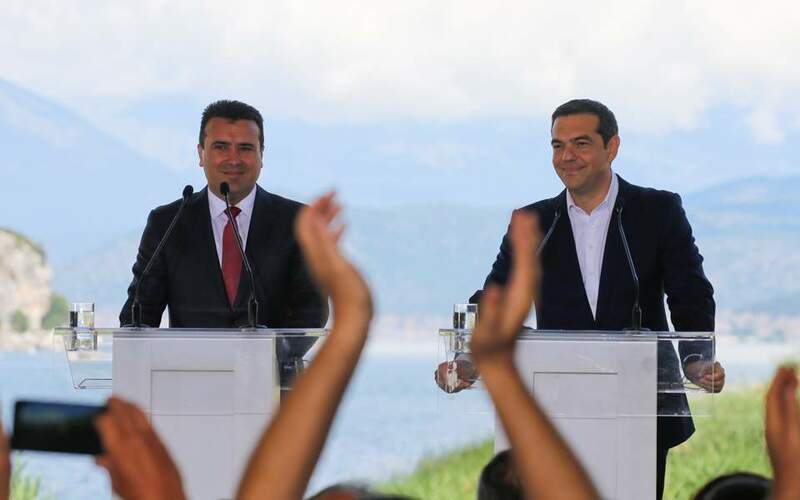 The two countries' prime ministers, Greece's Alexis Tsipras and FYROM's Zoran Zaev, attended the signing of the deal Sunday by the two countries' foreign ministers, along with UN and EU officials at the village of Psarades, on the shore of the Great Prespa lake. “This is a mutually beneficial agreement which fully respects the values and the principles of the people,” Tsipras said during a joint conference with his FYROM counterpart Zoran Zaev ahead of the signing of the deal under which the Balkan country will be renamed the Republic of North Macedonia. He said the deal heralded “a new era [of] stability, prosperity and security, adding however that both sides had to work hard to make this a “viable” agreement. “We have a historic responsibility that this deal is not held in abeyance, and I am confident that we will manage it,” he said. “Self-isolation will benefit no one,” he added. Following the signing, the officials left by boat for FYROM’s lake resort of Otesevo for a celebratory lunch. The agreement still requires the approval of both parliaments and a referendum in FYROM. Meanwhile, violence erupted Sunday when protesters demonstrating against the deal in the nearby village of Pisoderi tried to break through a police cordon and reach the lakeside village of Psarades where the ceremony was taking place. Police fired teargas to disperse the demonstrators. On Saturday, after more than two days of vehement debate in Parliament, Greece’s SYRIZA-led government survived a no-confidence vote brought against it by the main opposition New Democracy party, but with one less MP. The motion garnered 127 votes with 153 against. The junior coalition partner Independent Greeks (ANEL) backed the government despite its opposition to the name deal with FYROM that Tsipras announced last week, bar one MP, Dimitris Kammenos, who backed the motion. He was subsequently expelled from the party, reducing the government’s majority to 153. Before the vote, protesters gathered for the second day in a row outside the House to oppose the deal. Riot police fired tear gas at one point to disperse demonstrators. Many in Greece see the name issue as a bid by Skopje to hijack Greece’s ancient cultural heritage. Once the deal is ratified, Athens has said it will support the opening of negotiations for the former Yugoslav republic to join the European Union and NATO. Almost seven in 10 respondents in a poll published on Saturday are opposed to the name North Macedonia.